The Daily Clog » Free stuff galore! Okay, maybe not galore … but many a free things can be yours if you look carefully enough! 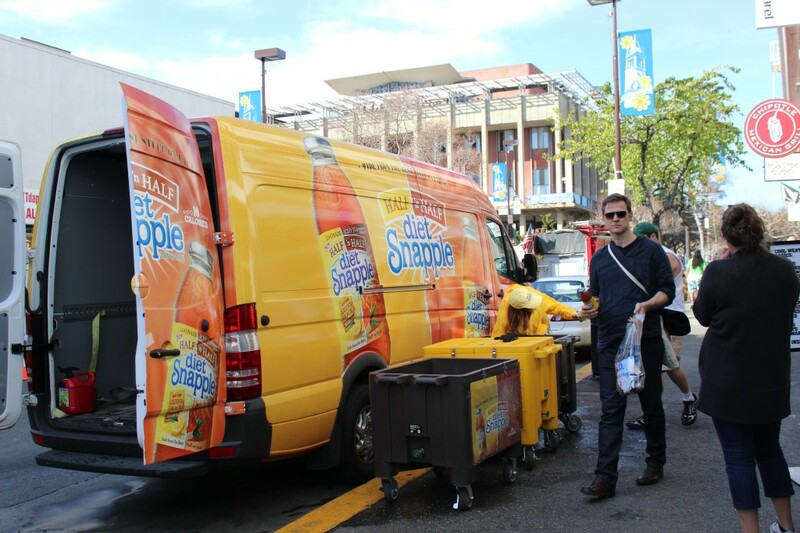 Did you happen to spot the bright yellow Snapple truck on Telegraph last week? It’s pretty hard to miss especially when Snapple representatives were handing out free bottles. They were filled with Snapple goodness obviously. There’s never a schedule for these kinds of things, so a wary eye and a careful ear can be essential for poor college students like us. Career fairs are excellent sources of free junk, but that’s the only catch … the stuff they give out are usually junk. Sure you’ll score the occasional Android plush doll at the Google table, but nothing worth any real value. However, websites like Munch On Me and your very own Clog can get you the heads up on certain freebies (important ones). Munch on Me is a popular site that advertises deals on local eateries, so set it to Berkeley and find yourself a deal! Currently there’s a deal on free passion fruit green tea from Pho Me Now, so that’s definitely worth a look-see. As for the free Snapple, they might come again, they might not. It’s up to you how attentive you want be! With almost everything that seems to be building within this specific area, a significant percentage of points of view tend to be rather stimulating. Having said that, I beg your pardon, but I do not give credence to your whole suggestion, all be it radical none the less. It looks to everybody that your comments are actually not totally justified and in simple fact you are generally your self not even fully confident of your assertion. In any case I did enjoy looking at it. I wanted to compose a quick comment in order to appreciate you for the awesome suggestions you are posting at this site. My time intensive internet investigation has at the end been paid with beneficial facts to write about with my relatives. I would suppose that most of us visitors are very blessed to exist in a fine website with very many lovely professionals with good guidelines. I feel extremely blessed to have used the web page and look forward to so many more exciting times reading here. Thanks once more for a lot of things.